If you’re even slightly active on Twitter, you probably know Russell Ward. With 14,800+ followers, he’s a massive presence in the online travel and expatriate world. 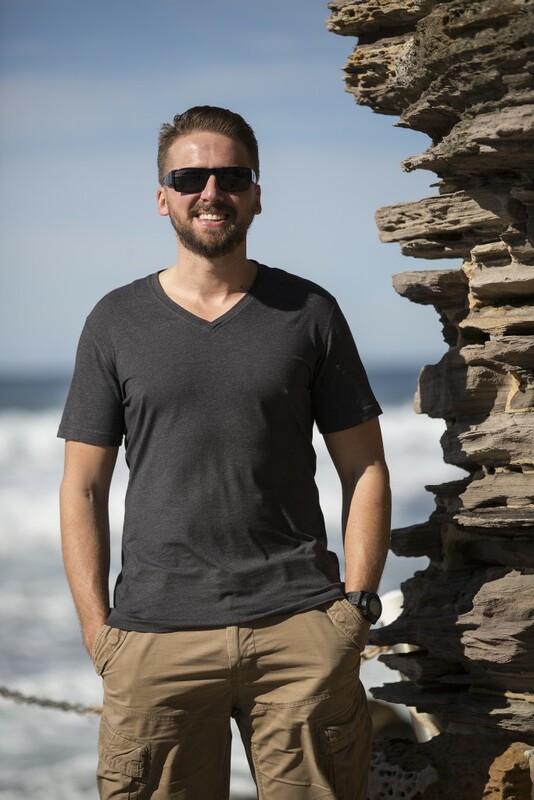 Russell is an expat, writer, traveler and blogger who holds British and Canadian dual citizenship (thanks to his Canadian grandfather) and acquired Australian citizenship five years ago. Born and raised in a small southern English town called Basingstoke, Russell left his hometown when he was 18 years old to study at university in the English Midlands before returning to Basingstoke at the age of 23 to work for IBM. While living and working back in Basingstoke, Russell met his Australian girlfriend (now wife), Sarah, and his desire to live abroad blossomed. Russell and Sarah moved to Canada in 2003, in part because of his Canadian heritage and desire to experience the country for himself, but also for the vastly different lifestyle on offer. They first lived in Vancouver where he was a graduate student, and then Ottawa, where he worked as a public servant, a role he admits he found less than inspiring. 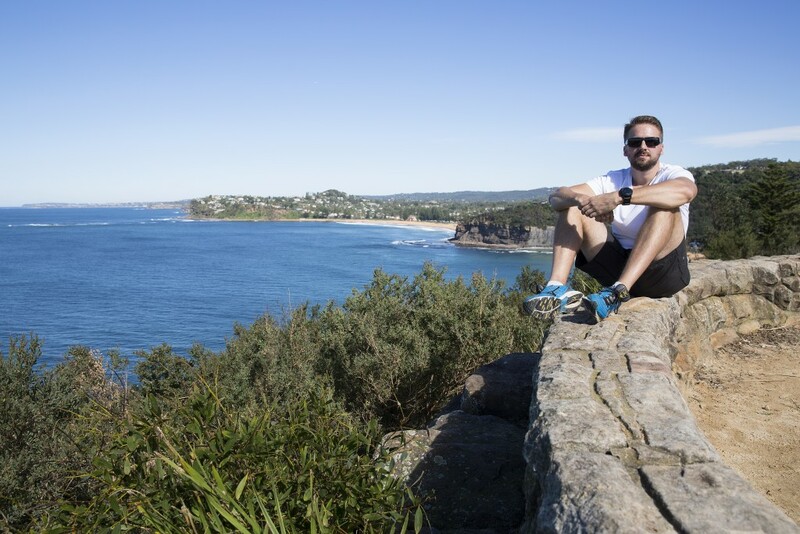 After three years in Canada, the couple left the cold and headed to the Northern Beaches of Sydney, Australia, where they have lived now for nine years. The couple has a son and just welcomed a daughter to their family. 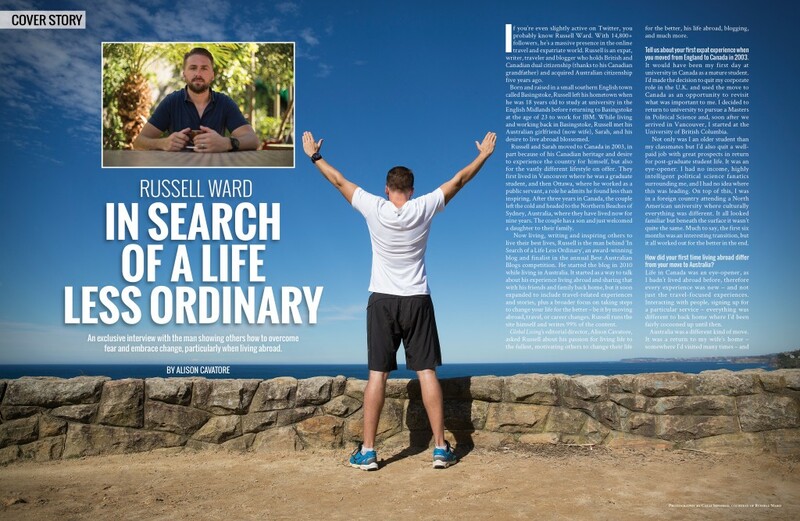 Now living, writing and inspiring others to live their best lives, Russell is the man behind ‘In Search of a Life Less Ordinary’, an award-winning blog and finalist in the annual Best Australian Blogs competition. 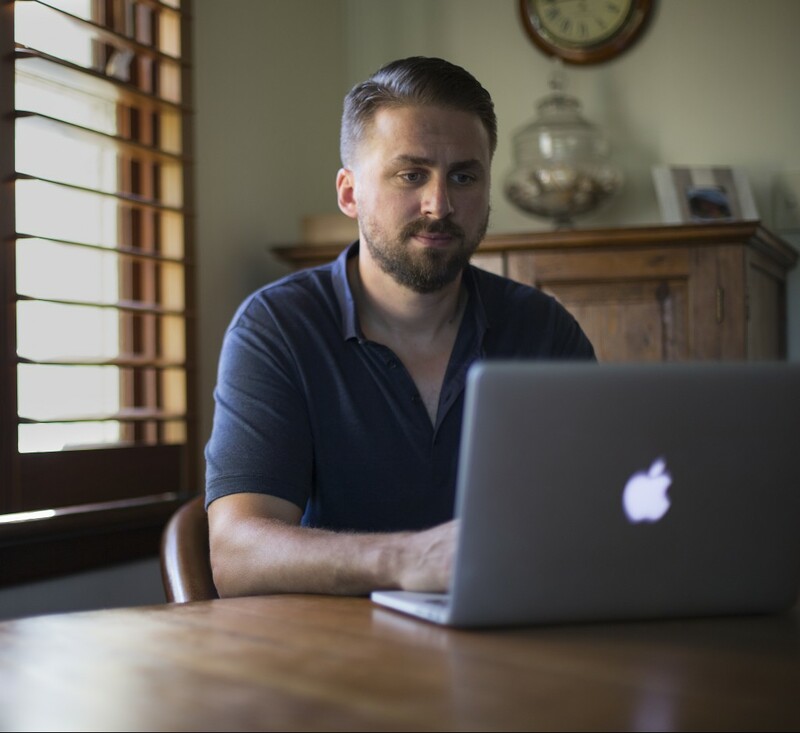 He started the blog in 2010 while living in Australia. It started as a way to talk about his experience living abroad and sharing that with his friends and family back home, but it soon expanded to include travel-related experiences and stories, plus a broader focus on taking steps to change your life for the better – be it by moving abroad, travel, or career changes. Russell runs the site himself and writes 99% of the content. 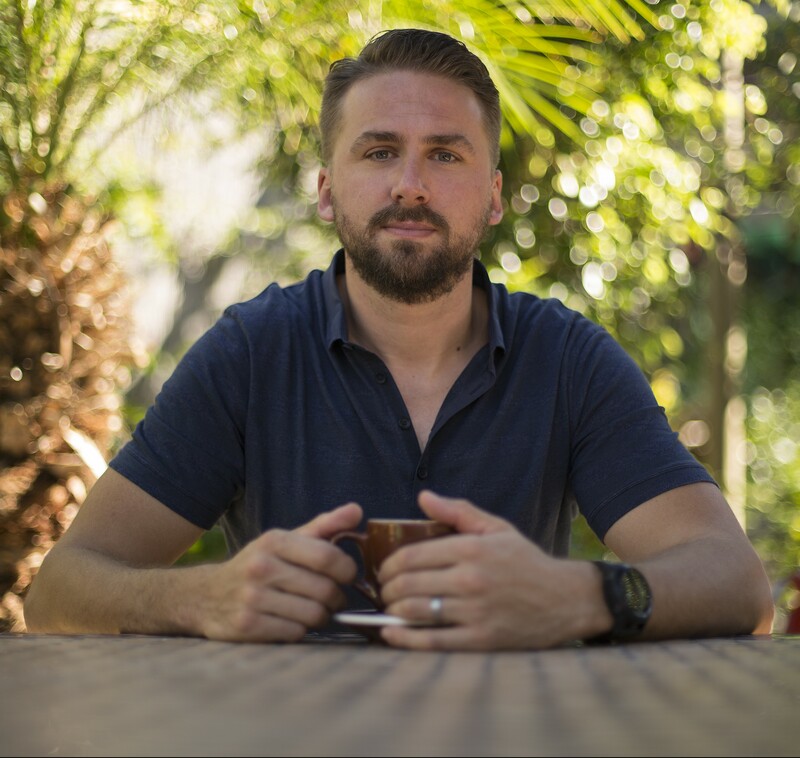 Global Living’s editorial director, Alison Cavatore, asked Russell about his passion for living life to the fullest, motivating others to change their life for the better, his life abroad, blogging, and much more. Tell us about your first expat experience when you moved from England to Canada in 2003. It would have been my first day at university in Canada as a mature student. I’d made the decision to quit my corporate role in the U.K. and used the move to Canada as an opportunity to revisit what was important to me. I decided to return to university to pursue a Masters in Political Science and, soon after we arrived in Vancouver, I started at the University of British Columbia. Not only was I an older student than my classmates but I’d also quit a well-paid job with great prospects in return for post-graduate student life. It was an eye-opener. I had no income, highly intelligent political science fanatics surrounding me, and I had no idea where this was leading. On top of this, I was in a foreign country attending a North American university where culturally everything was different. It all looked familiar but beneath the surface it wasn’t quite the same. Much to say, the first six months was an interesting transition, but it all worked out for the better in the end. How did your first time living abroad differ from your move to Australia? Life in Canada was an eye-opener, as I hadn’t lived abroad before, therefore every experience was new – and not just the travel-focused experiences. Interacting with people, signing up for a particular service – everything was different to back home where I’d been fairly cocooned up until then. Australia was a different kind of move. It was a return to my wife’s home – somewhere I’d visited many times – and it felt more familiar than Canada had – and culturally so too, with the close ties to the U.K. I was also more experienced at moving overseas so I knew what to expect and how to prepare myself. It still wasn’t a completely easy transition but I was older and slightly wiser. 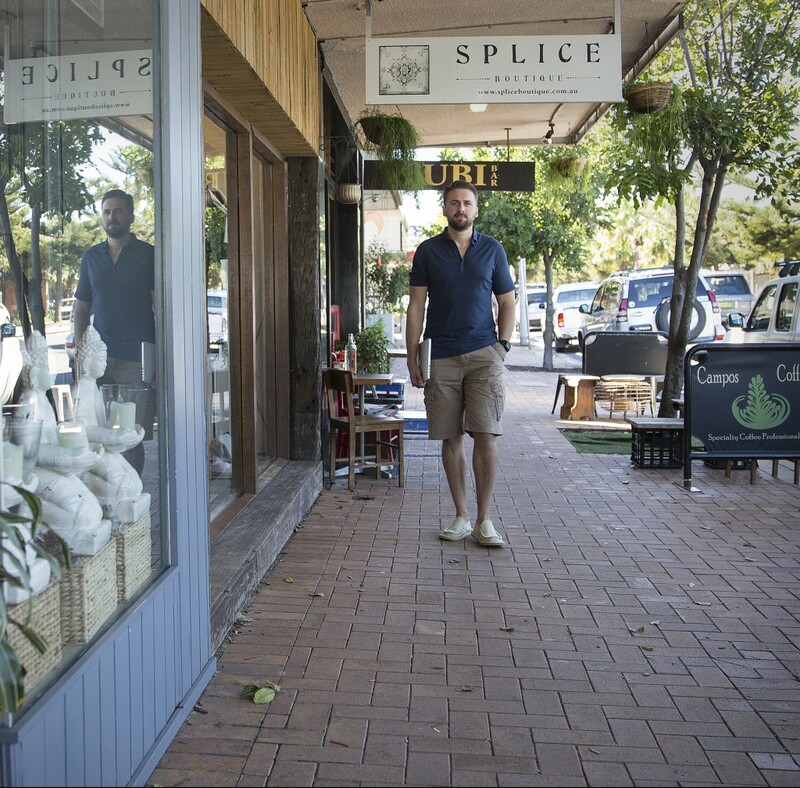 Now based in Sydney’s Northern Beaches, do you find yourself more immersed with locals or the expat community? I’m more immersed with the locals, without a doubt. The expat community here isn’t as prominent or as obvious as you might find somewhere like Dubai, for example. There are something like two million Brits here and many arrive and settle in to a new life as an immigrant and eventually citizen, rather than spend a brief period here then move on to the next expat destination. That, plus the existing ties to my wife’s family and friends, meant we became part of the community early on. I have many expat friends but we tend to see ourselves as part of the Australian fabric instead of as ‘outsiders’. You created ‘In Search of a Life Less Ordinary’ because, in part, you wanted to live your life to the fullest and not let time pass you by. Tell us more about how you’ve incorporated this personal goal into your site. I towed the line my entire younger life. I did what was asked of me, never questioned my path in life and made others happy with my choices. But I never did what was right for me and, as a result, my choices didn’t seem like a good fit – from the job to the lifestyle, the location to what I got up to for fun. I always craved change and I knew there was more to life than the 9-5 routine, evenings in front of the TV and weekends spent at the shopping mall. At 23, I worked in a job going nowhere. At 25, I’d spent the best part of my early years in a place that didn’t inspire me. At 27, I led a lifestyle that left me wanting for more. By 30, I had changed it all. I realized I’d given up any control over my life. I only saw longing and regret stretching out before me and I needed to take the control back. I knew there was more to life and I wanted to discover my calling at work, home and play. So I decided to quit my life in the U.K. and move abroad, revisiting what mattered most to me and leaving my traditional life behind. Writing was one element of this; I simply didn’t do it prior to life abroad. So what started as a way for me to share my experiences in living abroad, rapidly became an outlet for my writing – a way for me to develop my craft and passion, if you like – and a venue to reach others looking for a similar journey to mine. The blog allowed me to pursue opportunities – from sponsored travel trips to article features – which I would never have had the courage or inclination to do previously. And in some way, I’ve stayed the course with this direction because of the site, because I needed to be true to myself and keep at it. If you like, the site keeps me honest and also keeps delivering new opportunities my way. It’s a win-win. What has been one of the most important changes you’ve personally made in your quest to make time for the things that matter to you in life? Firstly, I dug deep to really understand what did matter to me. Over a period of years, I assessed what I wanted out of life and how I wanted to be remembered. Doing this has allowed me to reprioritize what is important and remove what isn’t. Secondly, I changed my working world, which I believe was a game-changer. I used to spend hours of my day commuting to and from the office; I’d be absent from home all week long and often working at weekends. I realized it was making me, and others around me, extremely unhappy and so it needed to be fixed. With the brutal daily commute and a job that gave me little pleasure, my saving grace was my writing. I wrote for the blog and also found other opportunities and outlets for my creative writing, which led to the founding of my writing business. Understanding the problem – and solving it – has probably been the single most important personal and professional change, and it’s made me a much better (and nicer) person to be around. Tell us about The Life Less Ordinary Manifesto. I’d written so much about the highs and lows of expat life, facing your fears and overcoming hurdles associated with major life changes, and I wanted to show others how they could also overcome their own fears and embrace change, particularly when moving abroad. The book, which can be downloaded for free from the site, is based on my most popular blog posts that show the challenges you might face in changing your life for the better, and how to take those first small steps towards living a life with more fulfilment and purpose. How to do what you love most; how to be who you want to be. It’s basically a call for people to declare their intentions to live life differently – on their terms, not the way others expect. It’s about knowing when it’s time to make those major life changes, whether moving abroad, changing a job or simply making tweaks to a currently unfulfilled life. In the book, you’ll learn the steps I took to improve my life and give it greater meaning, when the time is right to make those changes to live a less ordinary life, that change won’t be easy but it will be worth it, and how to take those first steps to turn a dream into an exciting new reality. What have been your personal highs and lows of the expat life? The personal highs have been around realizing that I’d created real change in my life. Real change meant opening myself up to it and stepping outside my comfort zone, and there is nothing comfortable about doing that. I faced homesickness, uncertainty, and loneliness at being away from my support network of family and friends, culture shock, and more. But, for me, the epic scale of experiences I knew I’d have, the drastically different lifestyle, the better life for my children. It reminded me why I wanted to put myself through this and that it would be worth it because it would make me a happier, more content, less restless version of my former self. And I’d finally be free to choose life on my terms with little or no regrets. In terms of lows, I thought that moving abroad would fix my concerns about the life I was leading, and it did give me more opportunities and experiences as relates to lifestyle. But in terms of my working life, all I did was change the view out the window. I continued to struggle to find purpose and meaning in a life centered on an ‘ill-fitting’ career. I reached a real low. I was doing so much to find something that would be better – life and career coaching, you name it. But actually the solution was right in front of me. My writing. Once I discovered the solution, then the problem that had followed me from country to country disappeared. You advocate that people should never stop searching, discovering, creating, and looking for more in life. What’s next for you, both personally and professionally? As I write on the site, it’s never enough to rest on your laurels. You need to keep working at your life to make it work for you. On a personal level, there is much I still want to see in the world, and many more publications I’d like to write for. But my focus is on family, with the arrival of our second child, and making sure I spend more of my time around them. On a professional level, my writing business is developing at a rate of knots, and we have plans to open several overseas offices, including in Canada and the U.K., so my focus will be on making that happen in a way that fits with our lives. Tell us about your content-writing business, The International Writer, and how it overlaps with ‘In Search of a Life Less Ordinary’. The International Writer is the culmination of everything I’ve talked about on the blog – about following your true calling, embracing your passions, bringing balance into your work and way of life, and refusing to accept an ‘ordinary’ life if you want something different. I literally couldn’t find a job that I wanted to do, so I had to create one for myself that encapsulates my passion for writing. 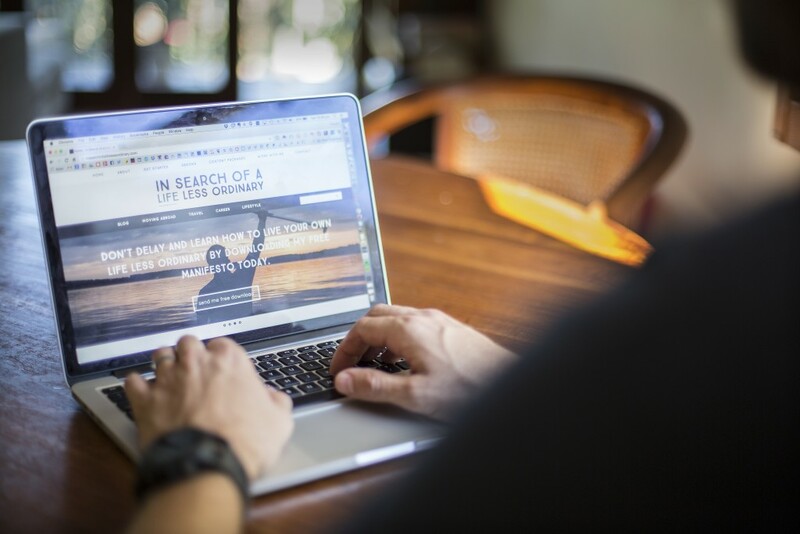 I was already working with a number of organizations and brands through ‘In Search of a Life Less Ordinary’, and people were enquiring as to whether I wrote professional content for businesses as well (blog posts, website copy, brochure content, and so on). Using the blog as my online portfolio, I began to grow my freelance writing projects and today I run a content-writing company with a slate of writers from around the globe. The International Writer also built on my desire to create a location-independent business. I wanted to not have to work from, or commute to, an office. I get to work on a diverse range of projects every day – from crafting a CEO’s LinkedIn profile to writing web copy for a paradise island resort. And I love the lifestyle achieved by working from home – being able to go for a swim in the morning, drop my son off at his daycare center, take time for lunch with my wife. It is a business that enables a lifestyle, and that is worth a lot to me. What is one key tip you can give readers to improve their online presence? Ensure you know what your personal brand is – your online persona, if you like, including what you stand for, what you believe in, your aspirations, your purpose for being online. Once you figure that out, ensure everything you do – from writing blog posts to creating a LinkedIn profile to status-posting on Twitter – fits with that personal brand to give you a consistent, authentic and hopefully engaging outlook. I find that when you do this, you can’t fail to attract followers, readers and admirers of your online work. The fact that I’ve married my passion for writing with a way of working that fits my lifestyle, not the other way around. I also didn’t realize how satisfying running your own business could be – of course it’s hard work, but the rewards (personal satisfaction, producing work you are proud of, monetary benefits) far outweigh any negatives. What advice do you have for other global entrepreneurs? There is something about moving and living abroad that enables you to consider options and opportunities that you might not have considered when you lived at home. Embrace that positive, creative outlook on life and have little or no regrets. Pursue ideas and possibilities, and explore ways of working, that will bring you success defined not just by financial wealth, but also by personal achievement. Try not to focus purely on the money but on the bigger picture – family, lifestyle, health. Do you have any plans, or the desire, to move again in the future? At the moment, we are focused on our family, as we welcome the arrival of our second child. Once the dust has settled, there are plans afoot to expand my business outside of Australia, and this will likely see us move abroad to set that up. I don’t believe you ever lose the desire to move internationally again. It’s as if you opened Pandora’s box, and the idea of having another global adventure forever lingers. I could happily share my time between any number of locations over the coming years! Find out more about Russell at www.insearchofalifelessordinary.com and www.theinternationalwriter.com, and follow him on Twitter @RussellVJWard and @theintlwriter and on Instagram @RussellVJWard. The Sept/Oct 2015 issue of Global Living Magazine is FREE in our app! If you enjoyed this article, please SHARE it with your friends, fellow expats and international networks!